Why did I read this book: I remember hearing about how awesome this book was when it came out last year, but never really had the time or drive to pick it up and get it out of the TBR. Then, this year, I saw a copy on my weekend trip to The Strand and I knew it was a sign – time to bust out this title and review it for Halloween Week. Once upon a time, there was a long line of kings who were all served by the Faithful Johannes. When the former king passes away, he tells Johannes to serve his son as loyally and helpfully as he served him, and his father, and his father’s father, and so on. Johannes also agrees to the last king’s wish that his son never see the secret portrait of the golden princess, for fear that the young king would fall hopelessly in love with the cursed woman. But somehow, the young king finds the portrait, and he falls hopelessly in love. When the king steals the golden princess and makes her his new queen, Faithful Johannes learns that great tragedy is in store for his sire and his wife – unless Johannes can stop the curse. And stop them he does, but at great personal cost – for he cannot speak of the curse without damning himself to stone. When the king and queen learn of Johannes’s great act of loyalty, of under-standing (that is, standing beneath them and shouldering their responsibilities and beliefs), the king decides he will do anything to bring Johannes back to life – even behead his own twin children. And behead them he does. Johannes is restored, the children are saved from their death because of the power of love and sacrifice, and everyone lives happily ever after. You see, these two children are Hansel and Gretel, and when they learn that their father killed them for another, they decide to run away from home (lest he decide to kill them again someday). Together, the twins steal off into the woods, and stumble upon a house made of cake. And so their adventures – a tale very dark and grim indeed – begin. I loved this book. I loved the whimsical narration style with frequent asides to parents and children (who will, presumably, be reading this book aloud together). I loved the fact that Mr. Gidwitz does not patronize and makes his children protagonists go through some really harrowing, bloody, terrible ordeals. I love that he makes them do this and the only reason they prevail is because they are children. As with authors like C.S. 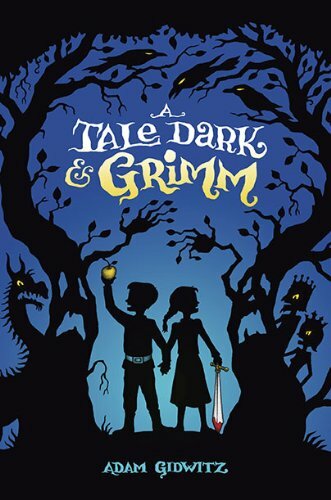 Lewis, Adam Gidwitz knows that children are the true heroes, not their silly parents, and A Tale Dark and Grimm is true to this fact throughout. The most impressive thing about this novel, however, is as true to the spirit of Grimm’s fairy tales as it is to the substance of those fables. There’s the familiar Hansel and Gretel tale with the witch and her oven, but there’s also the story of seven sparrows, a boy that turns into a beast, a twisted, handsome young man with green eyes and a taste for flesh, trickery and gambling with the devil himself, and a formidable dragon. I loved all of these stories, and how each adventure would bring Hansel and Gretel back on the path towards their true home. Once upon a time, in a kingdom called Grimm, an old king lay on his deathbed. He was Hansel and Gretel’s grandfather—but he didn’t know that, for neither Hansel nor Gretel had been born yet. Now hold on a minute. I know what you’re thinking. I am well aware that nobody wants to hear a story that happens before the main characters show up. They’re boring, because they all end exactly the same way. With the main characters showing up. But don’t worry. This story is like no story you’ve ever heard. You see, Hansel and Gretel don’t just show up at the end of this story. They show up. And then they get their heads cut off. The old king knew he was soon to pass from this world, and so he called for his oldest and most faithful servant. The servant’s name was Johannes; but he had served the king’s father, and his father’s father, and his father’s father’s father so loyally that all called him Faithful Johannes. Johannes tottered in on bowed legs, heaving his crooked back step by step and leering with his one good eye. His long nose sniffed at the air. His mouth puckered around two rotten teeth. But, despite his grotesque appearance, when he came within view, the old king smiled and said, “Ah, Johannes!” and drew him near. Again Johannes promised. Then the wrinkles of worry left the king’s brow, and he closed his eyes and breathed his last. Soon the prince was crowned as the new king. He was celebrated with parades and toasts and feasts all throughout the kingdom. But, when the revelry finally abated, Johannes sat him down for a talk. First, Johannes described to him all of the responsibilities of the throne. The young king tried not to fall asleep. Then he explained that the old king had asked him to show the young king his entire inheritance—the castle, the treasures, all this fine land. At the word “treasures” the young king’s face lit up. Not that he was greedy. It was just that he found the idea of treasure exciting. “Understanding them?” the young king asked. The young king thought about this. “So you will under-stand me, too?” he asked. “I will.” “No matter what?” “Under any circumstances. That is what being faithful means.” “Well, under-stand that I am tired of this, and would like to see the treasures now.” And the young king stood up. Faithful Johannes shook his head and sighed. You can read the full first chapter online HERE. This book sounds fantastic. Exactly the kind of thing I would have loved as a kid (and now). I’ve been looking for the perfect present for a tween reader and this sounds like it. I bet my daughter would love this. She loves Grimm tales, the creepier the better. Yeah, I just finished this book, and I loved it! Just the way I like my fairy tales. 😀 😯 This book was AWESOME! can anyone tell me why Gretel is responsible ( an exact quote from the story) Thank You! The book was good. we read it for our school book club and it was the only book that is good so far and it had some weirder parts but overall the book was good and good for teens to read. i love this book, its the best book in the world and i am reading “a glass grimmly “, and about to finish it so, i am looking for the third on!!!!! this book is amazing for middleschoolers?????????????? ?